Do you spend too much time on financial reporting? According to a study, many companies are still dissatisfied with their reporting. The VDT tool is the central tool for the analysis and visualization of important KPIs and their interrelationships for management, controlling and the finance department. To illustrate the relationships and effects of individual key indicators, so-called value driver trees are used. The Value Driver Tree Tool starts right here and helps with the visualisation, analysis and simulation of individual value driver trees. The VDT tool is a component for SAP Lumira Designer and can therefore consume all data available to the SAP BO server. What if analysis, profitability analysis, etc. can be created directly without loss of time. The complex interrelationships of the values are displayed quickly, comprehensibly and without loss of focus by the graphical visualization. 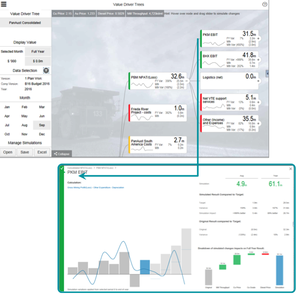 The great advantage of the VDT tool is that simulations of value-driving factors can be displayed graphically in real time and what-if questions can be answered in no time at all. If controllers previously had to maintain these simulations manually in their Excel files, they can now work together and evaluate across departments with the VDT tool. According to a study by Horvath & Partner, more than half of all companies are still dissatisfied with their reporting options. The VDT tool solves this problem: Once you have fed your value driver tree with all relevant data, the recurring manual data collection and evaluation is no longer necessary. You can easily simulate developments for any number of value drivers, as percentage deviation, exponential growth or absolute value. You can see the effects of the simulation immediately, without noticeable delay! For an easier understanding, the effect of your simulation is clearly shown for each individual value driver, but also for all value drivers above it. All key figures are mapped according to a uniform scheme, which makes it much easier to focus on the essentials. Business modeling: Use dynamic modeling to simulate an executive's view of the company and identify opportunities for efficiency and improvement. Budgeting & Planning: Compare budget versions and understand deviations in drafts. Strategic Objective: Simulate fully calculated scenarios based on current forecasts, budgets or actual data. Analysis: Understand the impact of changes to one or more value drivers on operating or financial results. With the VDT tool, any number of simulated changes to value drivers within a tree can be calculated and displayed simultaneously. Simulations only affect the current or selected period and future periods. How does the VDT tool work technically? The VDT tool is available as a local on-premise solution in SAP Lumira Designer. To ensure smooth navigation and simulation calculations within the tree, the VDT tool loads all actual and plan data from the system only once when the tree is opened. Then all actual and plan data, variances and the traffic light status of each key figure within the VDT Maths Computing Engine are calculated once in the browser. All other manual/loaded simulations within the tree are performed without noticeable delay. The VDT tool for SAP Lumira 2.0 Designer is developed by Visual BI. Nextlytics AG is an implementation and service partner for the German-speaking region. We recommend personal consultation. This is the quickest way to find out how the VDT can support you.